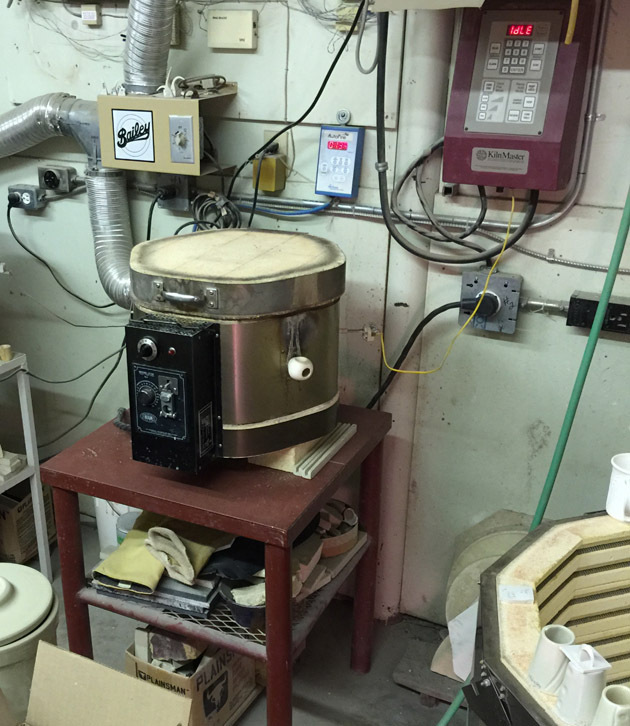 An electronic device attached to a kiln (usually an electric kiln). These controllers are usually capable of firing a kiln to a specific schedule and can shut it off at the right time, soak it for a specified period, and cool it down at a controlled rate. All industrial kilns, electric or gas, have controllers to assure repeatable firing conditions. All modern electric hobby kilns are equipped with controllers. Hobby and pottery gas kilns are also increasingly employing devices to control the schedule as well as the atmosphere. Controllers for electric kilns work on a duty-cycle, switching the power to the elements on for a few seconds, then off for a few seconds. The controller adjusts the on/off durations based on how the temperature is following the program. Technically, the controller switches relays (either mechanical or solid state) on and off, and they turn the power on and off to the elements. 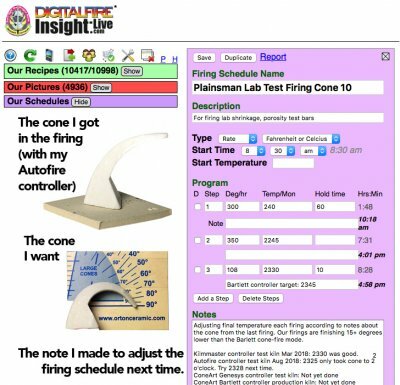 During a firing relays trigger thousands of times, and you guessed it, they are the most failure-prone part of the system. 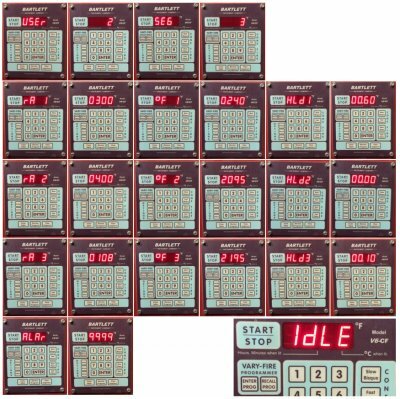 Controllers have built-in programs and can also be programmed manually by entering the rate, temperature and hold time for each step. Hobbyists are more prone to rely on the built-in pre-programmed schedules, using these to fire off-the-shelf glazes to low and medium temperatures. However, via manual programming, these controllers have revolutionised the ability of potters and more adventurous hobbyists to create special purpose glazes (e.g. crystalline, silky mattes). By creating drop-and-soak schedules (e.g. PLC6DS), they can to reduce glaze defects and improve surface quality and brilliance. Slow cool schedules (e.g. C6DHSC) are important to enhancing visual effects that depend on crystal growth (e.g. in rutile glazes) and for mattes. 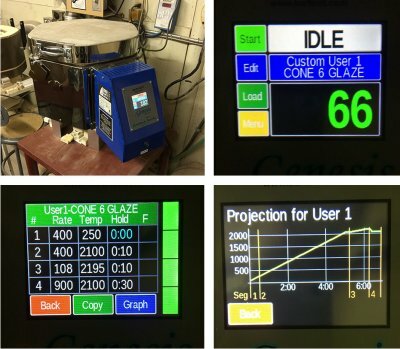 The key motivation for this it to be able to fine-tune the final firing temperature (cone-fire mode on many kilns can fire well below or above the temperature a cone would confirm correct). (the Bartlett LED/Keypad V6-CF or 3K). 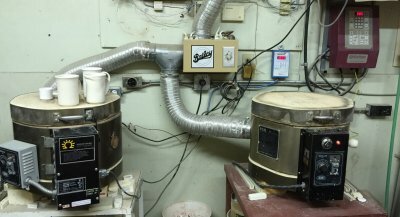 Two electric kiln controllers firing test kilns. Why are they so different? Red controller on the right: A Skutt Kilnmaster. Blue controller to the left of it: An Orton Autofire. These controllers both attach to a thermocouple in the kiln so they know the temperature. Both are external to the kilns (but there is a big difference). The controllers monitor the temperature change as they turn the power on in bursts, changing the length and frequency of the bursts to control temperature rise. 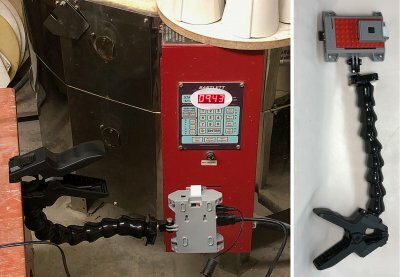 The KilnMaster controller is attached to the 220V power line and the kiln power line attaches to it (there are heavy duty electrical relays inside). The blue Autofire controller connects to the switching mechanism in the other kiln (built to receive it), thus no heavy duty relays are needed within it. The KilnMaster is more flexible since it can connect to any kiln, but it is also triple the price. Why program? None of the built-in schedules have hold times on any segments (these are a must for defect free glazes). None of them have controlled cools (a must for enhancing the effects of reactive glazes that develop crystallization or variegation). Tap the blue edit button to edit a program, then tap a column of any segment to edit its value. Tap a segment number to delete or duplicate it. Google "bartlett genesis controller" for short videos on creating and editing a schedule. A test kiln with firing controller: A necessity. Every potter should have one of these. This one has a separate electronic controller, newer ones have it built-in. Start with one of these and then graduate to having a large, second kiln. Ongoing testing is the key to constant development of product and quality. So many glazes appear as they do because of the firing schedule (especially the cooling curve). Imagine getting an awesome result out of a kiln and not knowing (or being able to replicate) the exact firing schedule that produced it. This device reads and records the temperature once per minute. It is a Raspberry Pi computer with camera, Wifi and custom software we made. It costs about $100 (with the Lego case and GoPro compatible gooseneck mount). Because the device is a full-power Linux web server I can login, see the list of schedules, and download any into my Insight-live.com account. 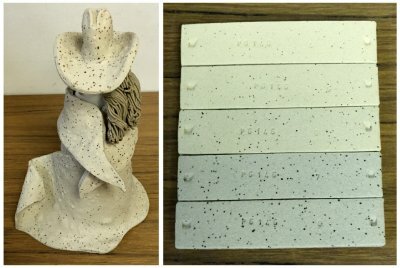 And then I can link that firing it to photos of glaze test results!